Marley® M Series Geareducers® require fewer oil changes compared to others that require oil changes multiple times each year. All Marley bearings have 100,000 hours minimum L10A service life. 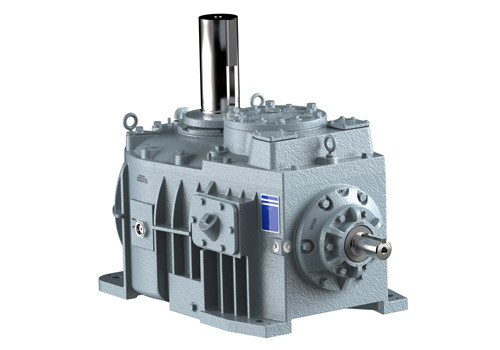 Marley Geareducers have a single piece spiral bevel gear head integrated with the pinion shaft for maximum strength, while other manufacturers may use multiple piece pinion arrangements. Marley M Series utilize a premium Inpro seal on input shaft to eliminate grooving and promote long life. Marley M Series use steel shims at all necessary casting connection points to maintain bearing settings as the unit ages. Marley does not require external vent lines, while others do. Marley M Series are designed to be simple, without the need for oil pumps, filters, or other options that add complexity, additional maintenance and potential for failure. *Marley M1712 castings are no less than 7/8” thickness while Amarillo 1712 castings are no less than 5/8” thickness. **Amarillo 1712 vs. Marley M1712; Amarillo surface area based on actual measurements of case with estimations given to account for curved faces. Result is 4,086 sq. in. surface area for Amarillo 1712 vs. 5,108 sq. in. for Marley M1712. ***Marley M Series oil passageways are no less than ¾” diameter while Amarillo passageways can be as small as ¼” diameter. * Amarillo is a registered trademark of Amarillo Gear Company. ** Per Operation and Maintenance Instructions for Amarillo Cooling Tower Drives OMC 8/15. 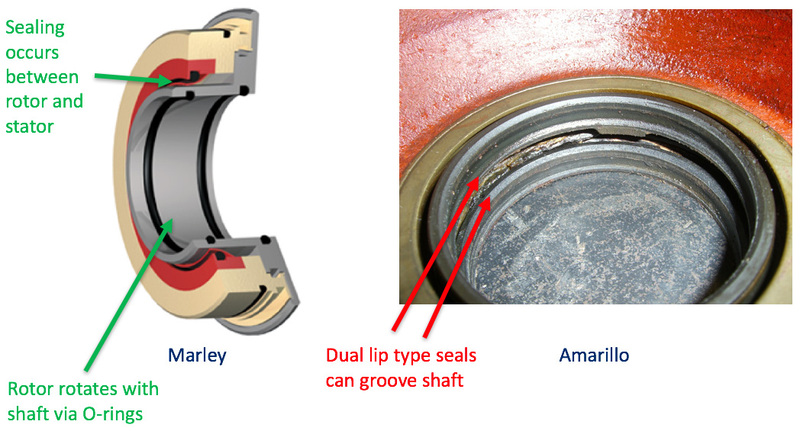 *** Based on current Timken bearing rating method for Marley Series 4000 vs. Amarillo 1712. **** Marley M1712 castings are no less than 7/8” thickness while Amarillo 1712 castings are no less than 5/8” thickness. Marley® System 5™ Geareducers® require only one oil change every 5 years compared to others that require oil changes multiple times each year. Marley Geareducers have a single piece spiral bevel gear head integrated with the pinion shaft for maximum strength, while other manufucturers will use multiple piece pinion arrangements. Marley stocks over 75 models with over 200 assembled Geareducers ready to ship. Low level oil indicator switches, anti-reversing devices, oil seal options. *National Technical systems (NTS) in 1998. 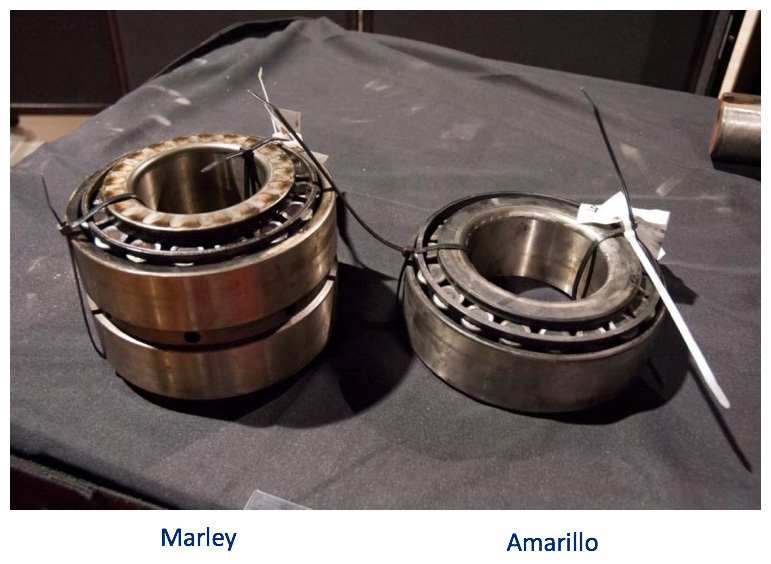 Concurrent testing was conducted on Marley and Amarillo gear speed reducers in accordance with SAE J2101 at various speeds and loads. ***Amarillo A36 vs. Marley 36; Amarillo surface area based on actual measurements of case with estimations given to account for curved faces. Result is 5,173 sq. in. surface area for Amarillo A36 vs. 7,586 sq. in. for Marley 36. **Based on current Timken bearing rating method for Marley Series 4000 vs. Amarillo A36. All units are factory dyno-tested under load to simulate operating capacity required in the cooling tower. By stocking components and cores, Marley provides flexibility to meet your specific needs with short lead times. Customers will receive a credit for each Geareducer core returned to Marley, with purchase of New or Rebuilt unit. May provide the lowest cost option that will still deliver Marley OEM performance. Marley provides a one-year factory warranty, covering all components of the gearbox, including seals, bearings and gears. *See the Marley advantages in the “Head-To-Head” comparisons, shown in the New Geareducer section of Proof in Performance. fixtures to meet all Marley OEM performance specifications. For repaired units, a thorough analysis by Marley technicians will provide you with the information you need to make an educated decision on the future of your valuable Geareducer asset. Gears and shafts will be replaced only if deemed necessary during the inspection. After installing a new Marley Geareducer, allow Marley to repair the old unit so you can maintain a spare Geareducer on site. Freight costs for delivery and return covered by Marley. Triple epoxy paint, oil seal options, anti-reversing devices. Repair units with existing value added options will be replaced in kind.